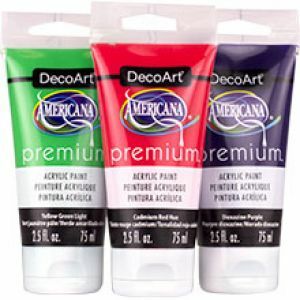 Decoart Americana Premium Acrylics - Tubes Discounts Apply ! Stretch your creative muscles by trying out this affordable artist-grade acrylic. It's a medium-bodied, satin-sheen formula created to work well on canvas. Its simplicity of design and use takes the intimidation factor out of fine art painting. It is ideal for many surfaces, including wood, canvas, metal, leather, ceramic bisque, and paper.